Origin of project is designer Frederic JOUFFROY’s wish to have a single boat, suited to different weather conditions. This, to avoid as possible to stay blocked ashore. Sea kayak success reveals a desire for easy wild ‘cruises’. Paddling is perfect to move on water when weather is calm, but in practice its use is limited soon, for non-trained people. As soon as wind rises , it is much more funny and restful to use a sail. Design goal has then been to get a craft keeping both kayak capability and easiness, while affording too function and effortless speed fun of light sailing boats. Adaptability to weather conditions brings self-moving and is a real safety factor. 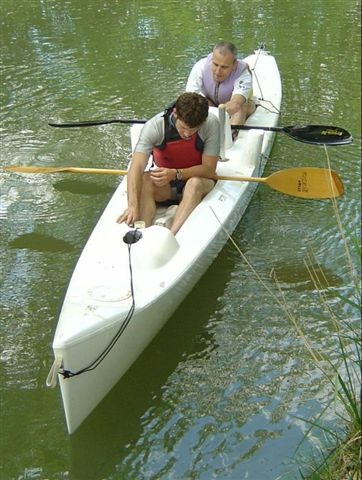 It significantly increases sail possibilities compared to an ordinary kayak. 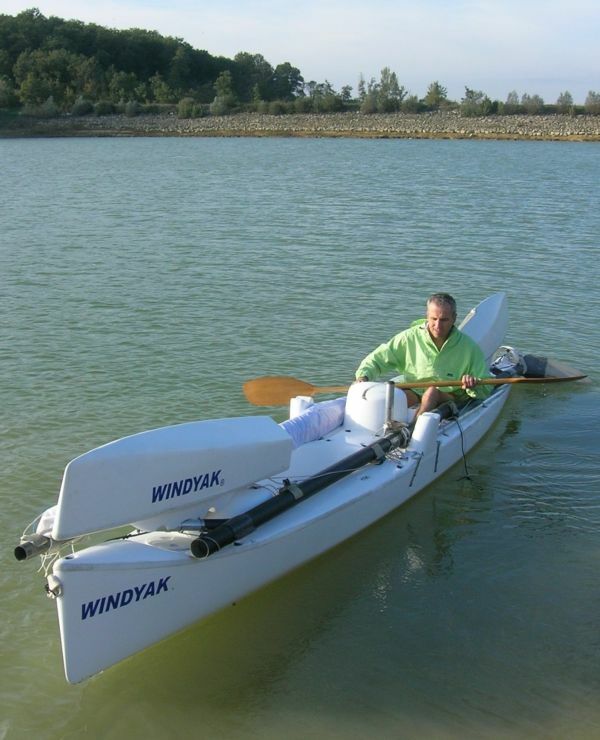 WINDYAK is a specific design, far from simple mounting of a sail on an existing kayak . 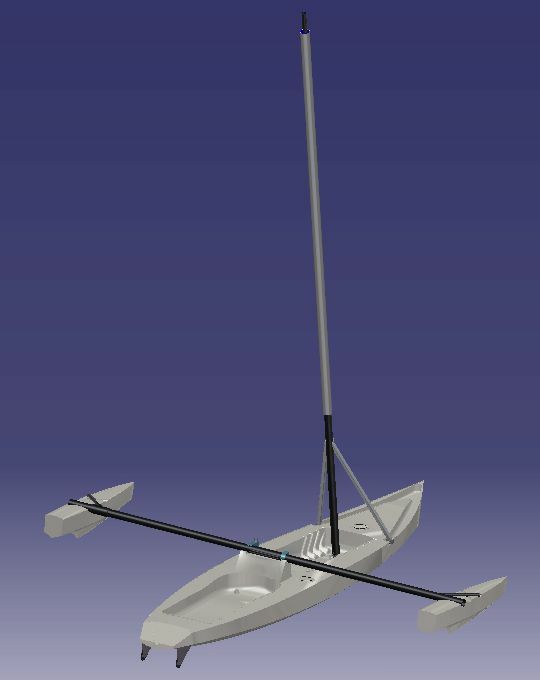 Short floats trimaran configuration ensures stability necessary to support a sail, while keeping a light and thin hull for easy paddling and handling. Hull length and volume give nice sail performance. ‘Seat-on-top’ deck design (without manhole) is comforting for beginners, adaptable to crew number, and allows heel control by moving crew on board. 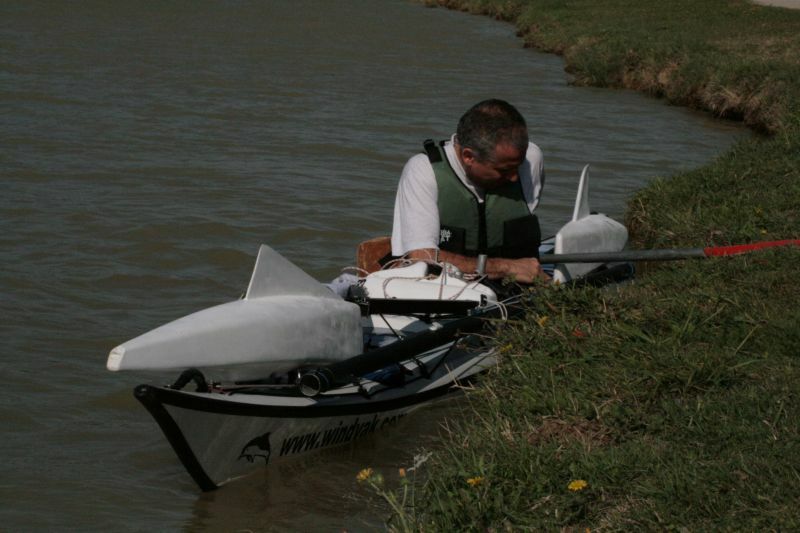 Trimaran-kayak concept is accessible, just as kayak, to some handicapped people. For transport, reduced hull mass allows easily heaving up. The whole boat can be carried on a 1 meter wide car roof without cluttering up the vehicle internal volume. The limited bulk is also practical for storage. Above all, WINDYAK can be folded- and unfolded- when sailing in a few minutes to convert from monohull kayak configuration into sailing trimaran one. This unique feature allows WINDYAK to adapt in real time to sailing current conditions, and to access as a kayak to any stretch of calm water : No beach is required to go to water, any bank or pontoon suits. The rig can be fallen in a few seconds to go under a bridge. 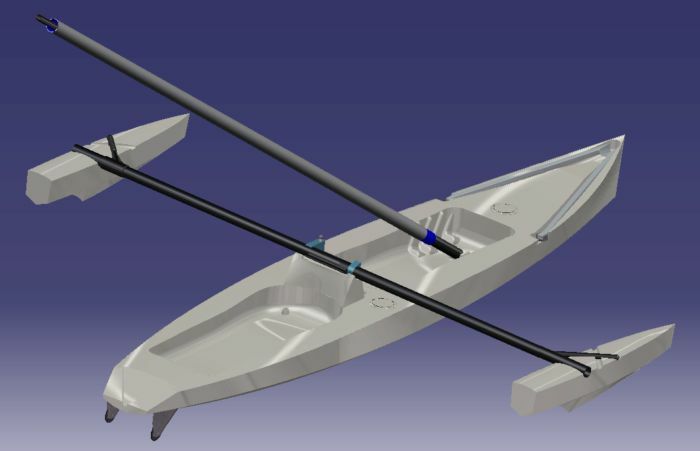 When folded, rig and beam are laid on each side, symmetrically, and floats at ends, all aligned with the hull, to not hamper paddling. 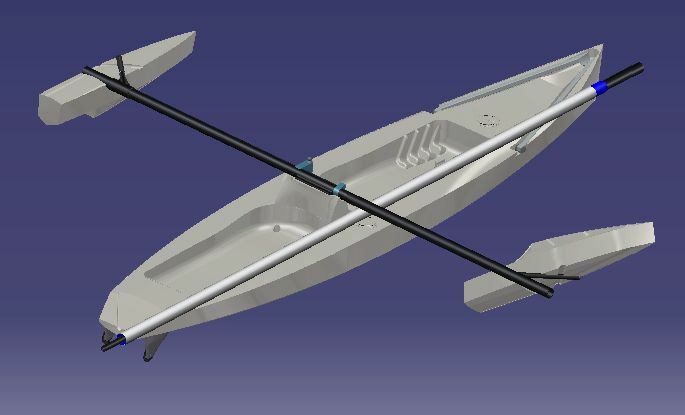 Unfolding is easily performed by a set of patented basic mechanisms : A few rotations of specific parts and rope hauling are enough to move and fasten beam and floats in stable trimaran configuration. 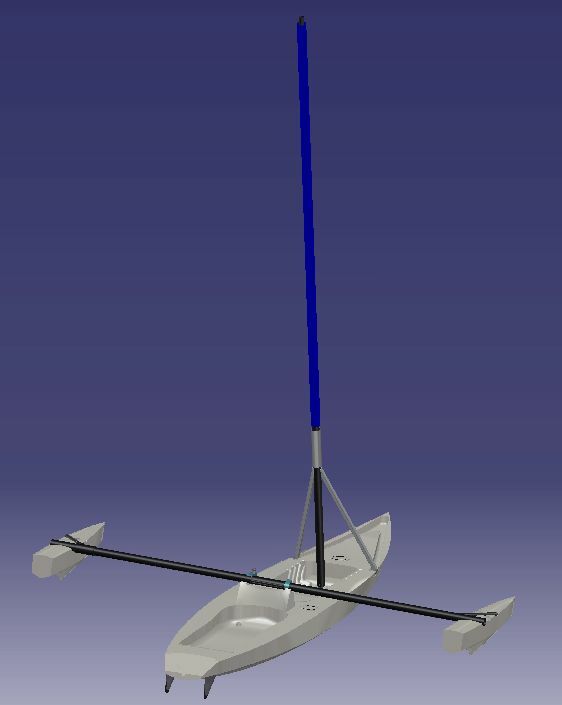 System is based on a particular geometric layout : a 45° angulated axle allows to fold the float above the beam, aligned with it, while providing for sailing the required stiffness of the float-beam assembly. Floats operation and fastening are controlled from central hull by ropes, this allowing unfolding on water. 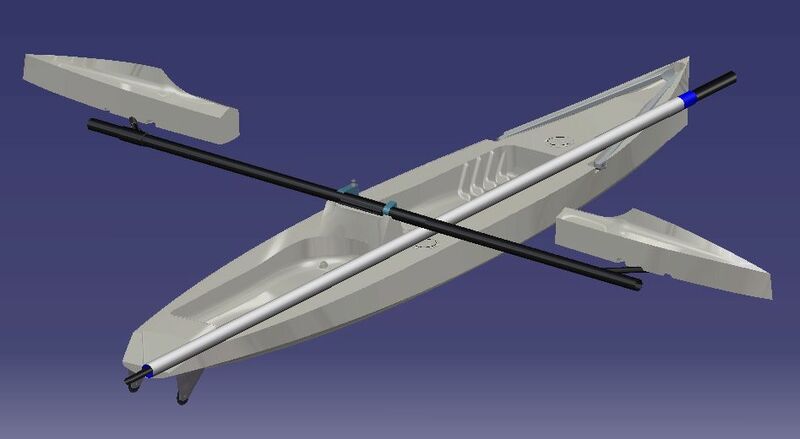 One-piece beam rotates itself between folded and unfolded positions , thanks to a vertical axle located on central hull.Beam fastening is easily performed by progressively hauling high resistance/high modulus textile straps. When deployed, breadth is greater than 3 or 4 meters and brings, joined with quite bulky floats(30 to 60 liters), an important stability giving safety and nice sailing performances. Once floats are unfolded, it is then possible, thanks to a halyard, to right against a partners the rig, jointed to deck at mast step. 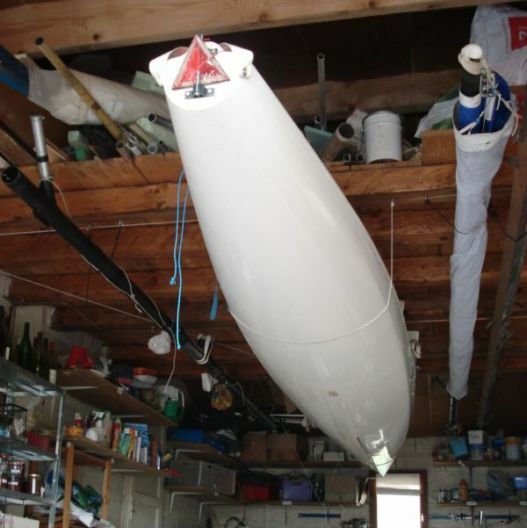 Last step to be performed, a sleeve maintaining the sail furled can be hauled down to obtain a 7 to 10 m² propulsive area . Note that you can also perform a very fast mounting ashore. pleasant to paddle; access to all waters. 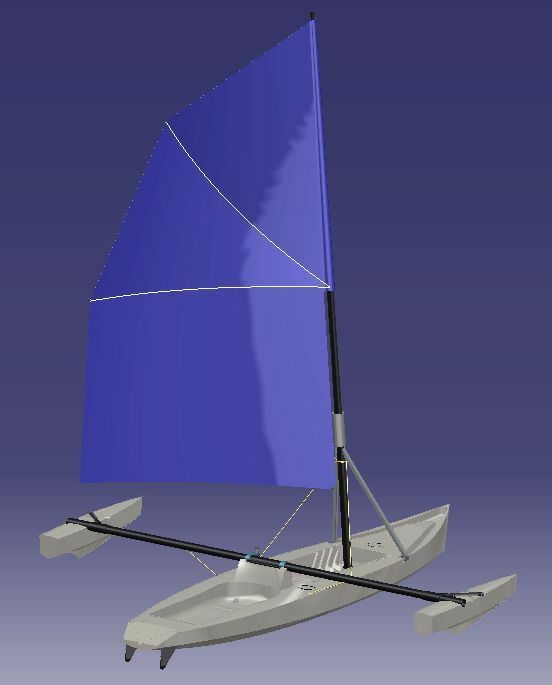 Quick folding/unfolding during sailing, an exclusive innovation to afford 100% of both kayak and sailing trimaran capabilities.